Filmed in 2000 and transmitted in 2001, Band of Brothers is a 10-part mini-series which remains the most expensive TV series ever made (at least until the budget for its new companion series, The Pacific, is revealed). The series was developed by Steven Spielberg as a continuation of the themes and ideas he explored in his hit 1998 movie, Saving Private Ryan. Whilst the film's running time meant that only a small portion of the Second World War could be depicted, the greater scope and length afforded to a series meant that more of the conflict could be shown and the characters' story arcs would be more satisfying. Also, it was decided that, unlike the purely fictitious Saving Private Ryan, the TV companion piece would be based on true events and real soldiers. 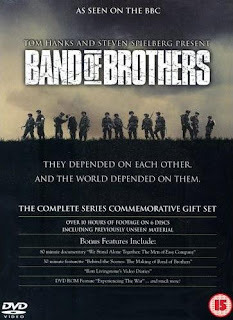 The rights to the book Band of Brothers by Stephen Ambrose were purchased and Ambrose and the surviving soldiers portrayed in the book were brought in to consult on the project. Band of Brothers opens in 1942, shortly after the formation of the 101st Airborne Division by the US Army. The first episode follows the training of Easy Company at Toccoa, Georgia, over the course of a year. They are placed in the care of Captain Herbert Sobel (Friends' David Schwimmer) who trains them far harder than the other men of the 101st, with the result that soon the company has a reputation as the best company in the division. However, Sobel's methods make him highly unpopular with the men, especially when it is revealed that his nerves fail him in field exercises. The unit is shipped to England to train and prepare for D-Day, but Sobel's limitations are eventually recognised and he is relieved of command. The second episode has the 101st parachute into Normandy just ahead of the beach landings. When Easy Company's commanding officer is killed during the drop, it falls to Lt. Richard Winters (Damien Lewis) to assume command and lead a daring attack on a German artillery position targeting the beaches. Winters becomes the closest thing to a central character and is one of only a few characters to appear in every episode. What initially impresses about Band of Brothers is its authenticity. Its production values would be impressive for a movie, but for a TV series they are stunning. But where the series really works is its focus on the characters. Whilst some events are dramatised or compressed for timing reasons, pretty much everything that happens in the series is based on a true event and every one of the main characters is based on a real person. This makes the series unpredictable and strongly emotionally resonant: if a character is wounded or killed without warning, it is because his real-life counterpart was wounded or killed at that point of the war. This is also why every single actor brings his A-game to his role: when the person you are playing is actually going to be watching your performance, or if he has passed away and his friends are, then you definitely need to be on top form. The producers seemed to realise early on that simply having ten episodes of non-stop carnage would get boring pretty quickly, so each episode is built around different characters and premises, and the individual episode directors are allowed to indulge their own artistic styles somewhat more than is normal on a television drama. A particular stand-out is the sixth episode, which focuses on Easy Company's medic during the Battle of the Bulge and follows him from unit to unit, seeing his friends get wounded and having to patch them up, or having to watch them die. It is an incredible piece of television drama. As is traditional with HBO, they don't make things too easy for the viewer. Easy Company is made up of several platoons, with some episodes focusing entirely on one group and others on all of them, meaning that characters appear, disappear and reappear from episode to episode. Characters are also promoted, demoted, wounded or killed off and the viewer is expected to work out who is who and what they are doing sometimes very quickly. This lack of spoon-feeding is as refreshing here as it is on other HBO productions such as The Wire, but casual viewers may find themselves swamped on first viewing. The series employs an interestingly desaturised colour tone, which puts its feel somewhere between full colour and black and white. Whilst this adds immensely to atmosphere, it does make telling some of the characters apart difficult, again on first viewing, especially as most of the time they are wearing full combat gear and helmets. For these reasons the series rewards careful re-watching and is also better suited to the DVD format, with the viewer able to watch several episodes in a row and work out who is who and what their roles within the company are. The series' action sequences rival some of the strongest war movies in their intensity and vividness, but it's in the quiet moments that it excels. The banter between the men is authentic and the importance of the bonds that form between soldiers in combat with regards to keeping them sane is strongly emphasised (more cliched, "I love you, Sarge!" moments are firmly absent, thankfully). In fact, one of the strongest moments in the series comes when one of the company's toughest, most effective lieutenants suddenly breaks down after seeing two of his men get their legs blown off in front of him. The mental pressures of the war are portrayed as being as dangerous and difficult to deal with as enemy action. Questions of morality in warfare are also intelligently raised: one soldier is rumoured as having brutally gunned down more than a dozen unarmed German PoWs on D-Day but later proves himself to be the bravest and most efficient officer in the unit whose actions repeatedly save the lives of his men. Band of Brothers (*****) is a staggeringly impressive piece of work, not just for its incredible budget and impressive special effects, but for its intelligent and often powerful writing, phenomenal acting and the resonance provided by knowing that pretty much everything that happened in the series is based on a real event. It is available on DVD in the UK and USA, and also now on Blu-Ray in the UK and USA. Is there some subtle reason for the five stars not being red? Great show. You should check out Generation Kill if you haven't already done so. Great write-up. I've got the box set, and have seen the entire series through twice. Brilliant stuff indeed. One of my favourite scenes is in the last episode (I think) where one of the Easy Company soldiers says to his CO, "So, the war's over?" and in the background you see these Austrian/German civilians sorting through the wreckage of their homes. The message being, of course, that for some it's barely started. brilliant review adam, I wish I could condense such a powerful message in so little space. I was in france a while back and went to Dead Man's Corner. There is a load of Winter's kit and other memerobelia there. It gave me a shiver down the spine to see it. Fantastic series. Excellent review. My hubby and I first watched the show when it aired in Finland back in 2001; we've sat through it several times since. BoB is a series that never gets old. 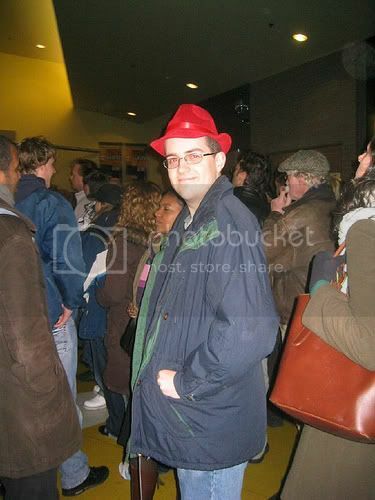 I thoroughly agree with your comment about Bastogne being the best episode of the show. Everything about it is just perfect; the realism in depicting warfare from one man's POV, the script, the powerful performances by the actors. New Song of Ice and Fire RPG on its way!